In another wave of accidents following multiple slide-related skier deaths in the Western U.S. earlier this month, two avalanches—one near Utah’s Electric Lake region on January 18 and another in Aspen, Colo.’s Castle Creek Valley region on January 21—have claimed the lives of two people. The Utah slide, occurring later in the afternoon on Friday, January 18, was triggered on a 37-degree, northeast-facing slope of Electric Lake Bowl at around 9,500 feet, the Utah Avalanche Center (UAC) reports. The slide, which broke three-feet deep, propagated 500 feet wide and ran a total of 600 feet. Neither the victim nor his partner were wearing avalanche beacons at the time of the accident. The UAC reports that Emery and Sanpete Search and Rescue arrived at 8 p.m. Friday evening but were unable to assess avalanche danger due to nightfall. The search resumed the morning of January 19 when the victim, buried a meter down, was located by avalanche dogs and declared deceased. A few days following the death in Utah, Mountain Rescue Aspen responded to a call received Monday, January 21 at 10:19 a.m. about an incident in the Express Creek drainage near the Markley Hut, The Aspen Times reports. The deceased—whose name has not yet been reported—is said to be around 50 years old and was staying at the hut with family and friends over the holiday weekend. Capt. Jesse Steindler told The Aspen Times that the victim and one other skier had gone out earlier that morning together when the avalanche occurred and that the deceased’s ski partner was not caught in the slide. The victim’s friend was able to locate the man and performed CPR but was unable to resuscitate the victim. In the January 21 Colorado Avalanche Information Center (CAIC) update, the slide reportedly took place at 11,200 feet on a north- to northeast-facing aspect, had a depth of two feet, propagated 500 feet wide and ran a total of 600 feet. That forecast released by the CAIC early Monday included a special avalanche advisory in effect through yesterday evening that warned of considerable avalanche danger after one to three feet of snow fell in Colorado on Thursday and Friday of last week followed by high winds. The CAIC noted that while natural avalanche cycles had mostly run their course, there was still a risk of large human-triggered avalanches. 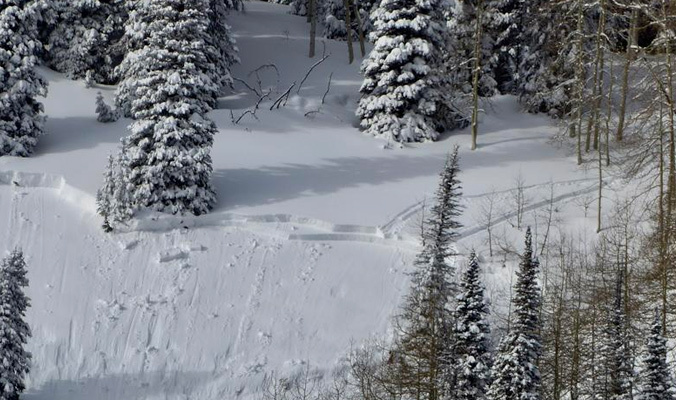 This slide is one of 280 avalanches recorded in Colorado since January 11, with a total of 44 human-triggered slides. Ten people have reported being caught in avalanches since that date. Since a backcountry skiing magazine titled “Backcountry” presumes authority of said subject, I’d like to point out that any backcountry skiing near Electric Lake would occur closer to Price or Spanish Fork, Utah than Salt Lake City. Given the number of backcountry skiers currently residing in or near Salt Lake City, it’s surprising that this lack of geographic awareness occurred. Evidently Backcountry doesn’t “backcountry” in Utah inlike everyone else. Yes, Utah’s backcountry skiing is not expansive compared to Alaska British Columbia, Peru, etc., but a quick Google Maps search reveals 120 miles separating Salt Lake City and Electric Lake. Any backcountry skier, and especially backcountry skiing “authority” reporting an avalanche fatality should appreciate the importance of place. Sorry Backcountry, but you need to take your game more seriously. We apologize for any confusion. We try to report to the best of our knowledge, and we make sure it include links to the incident reports and forecasts from the corresponding local avalanche center to make sure to provide the proper information relevant to the accident.